Title Manager now supports Joomla 1.6! 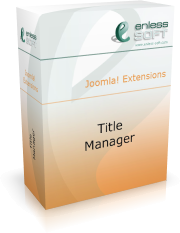 Title Manager is a native Joomla 1.5 extension that allows you to manage the title of the pages of your web site. The 'title' of a web site is the text that appears in the user's browser when the web site is currently displayed. The title is also used in the Windows taskbar to identify the browser window. Search engines use titles to determine what the current page is about, making it really important to use the right title. Joomla CMS does not currently provide a way for an administrator/manager to control the title of the web site. There is a default behaviour for assembling the title. It almost always uses the name of the current menu item. In some cases, the name of the current article is also used. Although in rare cases this might be sufficient, it is more likely to result in inadequate titles shown to the web site visitor. Title Manager is a simple, yet flexible title management system that is not bound to any particular Joomla component. Management is done using standard Joomla-style administrative interface. The title in our extension is defined by patterns. A pattern consists of the title parts that are used to make up the whole title. Those parts can be defined as static text, or dynamically using a PHP script or an SQL query. Also, there are some predefined core-Joomla title parts, such as: current article title, category name of current article, section name of current article. Video tutorials are now available for Title Manager. You can watch them here.